In today’s era where enterprises are managed through digital technologies, Microsoft offers a broad spectrum of products that are built on the foundation of scalability and rich functionality. Microsoft’s advanced and sophisticated product portfolio, supporting a wide range of programming languages, third-party tools, frameworks, and systems, has redefined business execution across industries. Being at the leading edge of technology innovation, Microsoft designs customizable products and solutions that are designed for the modern world driven by cloud, big data, and artificial intelligence. The company’s cloud platform, Microsoft Azure, allows enterprises to develop, test, deploy, and manage innovative services. Leveraging Azure as the cradle of innovation, Microsoft has created a bevy of business solutions comprising Microsoft Dynamics suite, SharePoint, and Office 365, streamlining employee collaboration and experience. Numerous organizations from an array of industries, including retail, services, manufacturing, finance, and public sector are leveraging Microsoft Dynamics. On the other hand, the highly configurable content management system, ‘Microsoft SharePoint’ is enabling enterprises to centralize access to internal information and applications and can be used as a file hosting service or a personal cloud. Products such as Skype for Business Server and Exchange Server further bring value to the modern businesses, providing them the necessary capabilities to stay agile, connected, and productive. 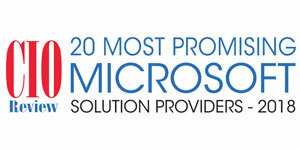 To help enterprises choose the best solutions provider that has in-depth expertise in Microsoft technologies, CIOReview brings forth a competitive list of the best solution providers. Our distinguished panel that comprises prominent CEOs, CIOs, VCs, and analysts, along with CIOReview’s editorial board has assessed several Microsoft solution providers and shortlisted the ones that are distinct in terms of their value delivery.